Arsenal win as Rocastle is remembered. At last the proper football is back, the international break is finally behind us for the season and now the chase for top four can continue uninterrupted. Reading came to town yesterday, in normal circumstances a home banker but so was Blackburn. So nothing was to be taken for granted, we have fallen to way smaller teams this season and it was important to keep up the recent momentum in order to maintain the pressure on Spurs and Chelsea. Equally important was the opportunity to honour the twelfth anniversary of David Rocastle’s passing. His family was invited as special guests as the club paid homage to the man who is so close to many gooners’ hearts. This was my first game back at Emirates since the embarrassment which was the Blackburn game in the F.A. Cup so I was quite eager for the team to put things right on a personal level and remove any possibility that my attendance was evolving into a fully fledged jinx. Rocky will never be forgotten. His name gets sung from the stands, many a fan buy shirts with his name on the back. David Rocastle is one of those players that the fans remember fondly. He was taken from the world way too soon and despite being not being on the clubs books at the time of his passing he was an Arsenal man through and through. The club doesn’t have to dedicate days to the man, no one is holding a gun to their head however it is a nice touch that the club recognizes his contribution to its history. He came through the ranks at the club, he represented England when with the club, he was part of one of our greatest nights in our history playing in that game at Anfield 1989 and was genuinely a talented player. The club paid tribute to Rocky yesterday prior to kick off, a picture was also displayed on the big screen and the fans sang his name. A rare occurrence happened yesterday when the game was going on; the fans started sing the Rocastle song to the point where the whole stadium was in sync. What was a nice touch by the club was the decision to remove the game stats from the jumbotrons and re-display the picture of Rocastle. The singing went on for at least 5 minutes all while the game was still playing. It was a lovely gesture and I am sure everyone connected with David Rocastle will have appreciated the experience. The curious case of Gervinho. Only Gervinho could score one goal, set up a further two, leave the pitch to a standing ovation and still not convince the fans of his worth. He had a good game by his standards, he provided end product and along with Santi Cazorla was in contention for man of the match. Gervinho is a confidence player and the fact that he grabbed the opener did him a world of good, the only problem in his case is the trademark misses were still there. In the first half plenty of chances and opportunities were wasted, although we were winning the longer the game stayed at 1-0 the more the opposition could grow in confidence. Gervinho was at the heart of most of the attacking moves in the half and it is a question of do you blame him for wasting opportunities or do you applaud him for being dangerous enough to be on the end of and create the chances? The fans in the stand were divided and I’m sure many a fan watching on TV were the same. Most importantly in our run for top four we need to get behind every player. Gervinho offers an alternative and on his day can be devastating; maybe with the crowd 100% behind him his devastating best can become more frequent. After the two previous games resulted in clean sheets the Arsenal defence didn’t manage a third as they conceded a goal against Reading. The defence in general played well and the trademark shakiness when on top was not there yesterday. The goal conceded may have been avoided but this was a much focused performance from the back five overall. 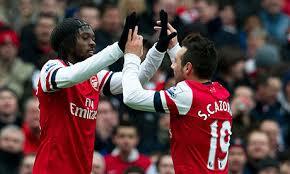 Arsene made a change to the defence by drafting in Bacary Sagna at the expense of Carl Jenkinson. It could be deemed unfair to drop Jenkinson as soon as Sagna returns but I suppose a home game vs. Reading would be deemed a good opportunity to test Sagna’s legs on his return. Sagna’s experience will be vital in the run in and I’m sure Jenkinson will still get opportunities on the pitch before the season is over. Should Arsene have changed a defence that achieved the last 2 clean sheets? Normally you would say no but I guess he had to change it already due to the cup tied situation of Nacho Monreal, so the left back position has been shared and Arsene took the opportunity to do the same with the right back position. The important core has to be the centre-back partnership, there’s no need to tinker there unless forced and I’m happy the manager is keeping the two together as yesterday may have been classed as an easy enough game to swap things around. The Arsenal boys can hold their head high after last night’s performance. After the debacle of the performance in the first leg it really was a night of damage limitation. The Arsenal managed to restore a lot of pride and belief with a totally unexpected 2-0 win at the Allianz Arena. It was the perfect outcome behind obviously pulling off a victory clawing back the 3 nil deficit. It was important leading into the match that the players raised their game and put in a performance to restore the belief that could hopefully be transferred into the domestic form. It has been a long wait since the last game against Tottenham for the Arsenal players to get on the pitch and right their recent wrongs. I’ll hold my hand up and admit that I didn’t believe Arsenal would win the tie; I believed they could win on the night but not enough to go through. By the time Koscielny planted that header in the back of the net all scepticism was thrown out the window as my fingernails were chipped away with nervous tension. Arsenal may have bowed out from the competition but much like the exit to AC Milan last season they can draw strength from the performance and channel it to the chase for top four position in the Premier League. In a night in which Arsenal had nothing to lose they walked away gaining so much. Much respect to the players on the pitch because based on the rumours leading up to the game of players left out and then viewing the starting line up the final result did not seem possible. Fabianski in goal is enough to send the jitters through to the bones of Arsenal fans. Spending the majority of the season on the treatment table he was drafted into the starting line up for his comeback game in quite high profile circumstances. Fair play to the Pole, he did everything right on the night; it was an assured performance and a sign of what he can be capable of. When he is good he is good but the bad often outweighs the good, let’s hope he can change that trend if he is called upon again this season. Koscielny was magnificent in partnership with Mertesacker at the centre of defence. That is probably one of the most frustrating things about the defence. We know they have these performances in them but on too many occasions the errors undo all the hard work. Koscielny has been disappointing this season in comparison to his efforts last season however last night showed why the manager believes in him. Jenkinson also had a big game last night, he has improved with the run of games he has had in the side and Arsene will have a dilemma when Sagna returns to fitness. At the start of the season when Jenkinson was playing to a high level and growing with each game he was unfairly yanked from the first team as soon as Sagna was fit. I think this time when Sagna returns to fitness he should earn the right to usurp the English right back from the starting eleven. It was good (and a relief) to see Gibbs return to first team action, he certainly contributed to the performance last night and it was important he lasted the 90 minutes. Of course Nacho Monreal has settled in well to the team but some competition at this stage of the season will keep the two left backs on their toes. All the players played their part and helped to erase the memories of the first leg defeat. When you think back Arsenal were so out played in that game they made Bayern look like supermen. Last night Arsenal made those Bayern players look human; they had them scared in the end and reduced them to scurrying in the corners and playing for free kicks to waste time. The players put in a shift and fought until the end to get the result, what they need to do now is transfer that into the game with Swansea at the weekend. Everything earned last night will be for nothing if they come up short against the Welshmen. I understand it was a tough gruelling game away in Europe which will be followed by a tough away game to a Swansea team that have given Arsenal some tough games this season but this is the time to build on the momentum. There are players rested who can return to duty and with a number of options in the squad fatigue should be heavily reduced. Well done Arsenal, enjoy your feats from last night but don’t dwell on it too long, there’s a job to be done at the weekend. Frustrating times once again for gunners fans across the land. With hopes of pulling off a result to get our season back on track we came up short once again. How do you put a finger on it to pinpoint the cause? The problem is a finger isn’t enough to identify the cause, two hands may not even be enough because the problems identified before the season are still there, the problems identified when the last transfer window opened are still there and right now there is nothing that can be done to fix this until the season is over. It‘s never nice to lose any game, double that feeling when it comes at the hands of your local rivals. We are at the business end of the season and now is not the time to throw things away, with each week we are losing time to put together this magical run of form which is meant to save our season. With our champions league campaign over (I’m sorry but it is), all focus should be on the league, every game treated as a cup final (a cup final we win, get out of my memory Birmingham game!) as the players fight to the end to repay the managers faith in them. It’s not quite working out that way so far and I hope that Arsene, if still in the Arsenal hot seat next season will take note of those that have underperformed, let him down and put his own position at the club under the greatest pressure it has ever been. Defence not solid as a unit. It feels like Groundhog Day having to write this same problem up so many times this season. The Bould factor has long evaporated and each week we have come to witness our evident defensive shortcomings. In the games where we keep a clean sheet it tends to be pure luck that we do not concede. Our back line just does not perform well enough in games to form a basis in which to win a game. Every game we play the opposition know they are good for a goal against us, we guarantee in every game at least one golden opportunity for the opposition to score a goal. It just depends on the quality of the player that gets the chance whether they take it or not. When we concede goals we should be saluting the excellence in creating an opportunity against us but instead we end up noticing how comical the defending was that gifted the opposition the chance. This is a trend that needs changing and fast. Giroud was probably our worst performer in the match, totally ineffective, he was totally out of tune with the rest of the team and highlighted one of our biggest shortcomings. Up front we lack a match winner to make the difference in games finely poised. I believe Giroud has a lot of qualities we’ve lacked in previous seasons but those were qualities that were required as a plan B when things didn’t work. Our system does not allow Giroud to play up top with another striker and so we have to rely on him as our main attacking threat. Arsene didn’t buy a striker in the last transfer window to compliment the Frenchman or provide an alternative when things aren’t working and yesterday was a fine example why it may have been a mistake. In the early stages of the game when we were pretty much in control Giroud found himself in the position to run onto a couple through balls but lacked the pace or cutting edge to produce a goal scoring chance. I believe ruthlessness should be shown in front of goal at any time in a match, we should not be waiting until we are behind late in a game to put real effort in. sometimes a chance can be missed early in a game much like yesterday and when wasted it is shrugged off because the forward expects more of the same. In big games chances aren’t guaranteed in high numbers throughout a game so you have to take your chances whenever they come. Yesterday that was taken for granted and we paid for it. This is not a dig at Mikel Arteta, he is still one of our most vital players but his strengths are not fully utilized in the holding role. We have not replaced Alex Song who despite his tendency to drift forward to help in attack offered a physical strength that we currently lack. It was good business getting the money we did for Song but in not signing a replacement we weakened the squad. We really have lost the knack to raise our performance for big games. When we have faced a top of the table clash we have come up short almost every time. This is a worrying habit and the only consolation is that we only really have Manchester United left to play from the top teams although Everton could maybe be added to the list. With the limitations of Olivier Giroud and no possibility of signing a new striker would it hurt to give Podolski a run of games up front? Theo Walcott can play up there but struggles against teams that play deep. The German has been preferred on the left hand side by Wenger and hasn’t really tried him there. He can finish, he is mobile and I’m sure he could get on the end of the chances the midfield make for the forwards. It is only a suggestion but you look back to earlier in the season when Gervinho was given a run there and wonder why wasn’t Podolski given a similar opportunity? What’s with Ramsey at right back? This is a weird one for me, the use of Aaron Ramsey as a makeshift wing back. We were first introduced to this in the game at Sunderland when a red card forced the use of the Welshman there. Now we are seeing it more and more; on reflection Ramsey played well when moved there but Carl Jenkinson was also having a good game at right back. In the grand scheme of things it weakened our defence at a time when we were chasing the game and needed to ensure a third goal didn’t go in. I believe Jenkinson and Ramsey offered the same attacking threat and therefore found the change bizarre. Try to enjoy your day people. Stay strong.